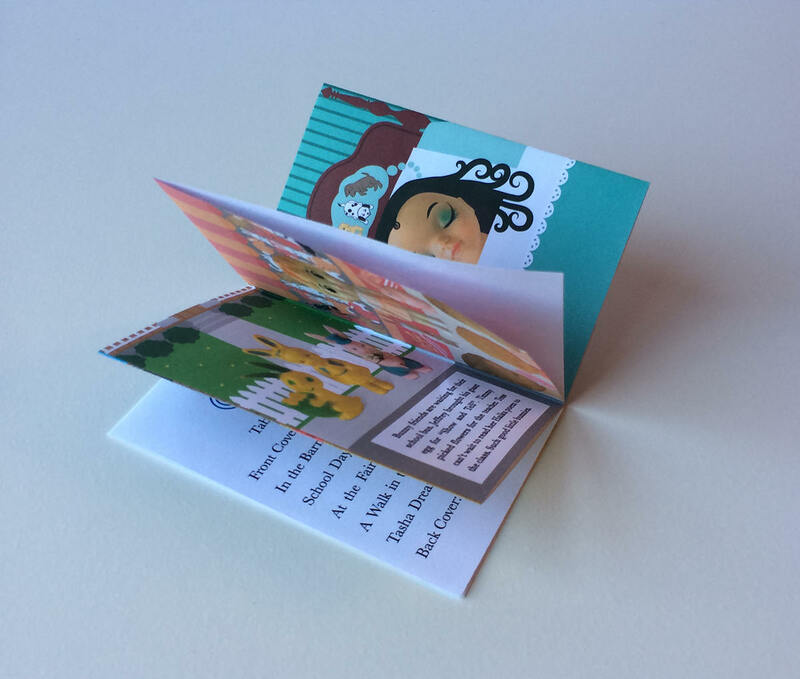 This is my Cutie Patooties mini zine (mini book). It measures 2.75” wide x 4.25” high. The images above show the mini zine along with some of the dolls and figures I photographed and included in the mini zine’s artworks. The actual dolls and figures are not included with this listing, just one mini zine is included. The third image above shows how I cut and fold the paper to make the book. 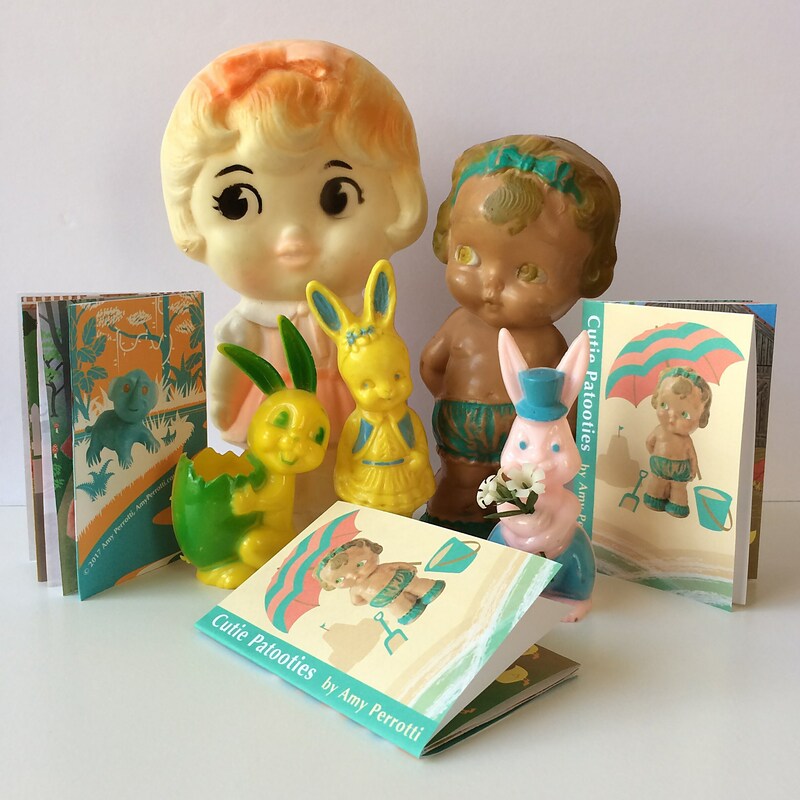 This fun little book features seven artworks inspired by vintage cuties. To create the artworks I photographed vintage dolls and figures, drew little scenes for them, and then placed the photos in the scenes. Also included is a table of contents listing the titles of each artwork. The dolls and figures I photographed for this project came from my personal vintage collection. My family and I enjoy going to antique and thrift stores, and shopping for vintage items online too. The doll head I used in the artwork “Tasha Dreams” I’ve had since I was little. The body disappeared years ago, in fact I can’t even remember what it looked like or why it’s gone (a mishap probably when we moved from SC to NC). All that remains is this cute little head. I could never part with it. It was just too adorable! And now, at last, I understand why. It was meant to be included in this little book! It reminds me of my daughter with her jet black hair so I named the artwork it inspired “Tasha Dreams” after her. Tasha can always tell when a drawing is based on her because I always include a swirl of hair at the hairline like the one at the top of her forehead. I titled the mini zine “Cutie Patooties” because it is a phrase from the 1920’s or 30’s and I thought it described the vintage items well. 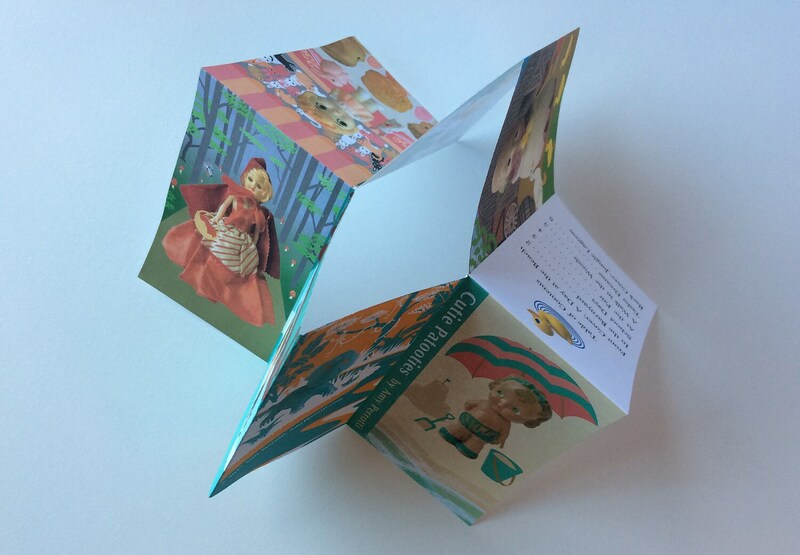 I print the mini zine on acid-free paper with an inkjet printer and high quality inks for beautiful color that resists fading. I will send you a shipping notification (email) to let you know I’ve mailed your package. Normally I ship all non custom items within 2 days of receiving payment (unless one of those days is a US national holiday when post offices are closed). Saturday orders will be shipped on Monday.